One of the more affluent and upmarket residential areas in Delhi, Kirti Nagar is one of the best and poshest places to reside. Centrally placed locality of West Delhi and home to Asia’s largest furniture market, Kirti Nagar is Delhi’s furniture hub, with premium interior design boutiques, modular kitchens, home decor and home remodelling showrooms of numerous domestic and international brands. Residing in this lush green area surrounded by trees and beautiful parks away from the hustle bustle of market areas is a sheer pleasure. The colony mainly constitutes many eclectic and beautiful private houses, popularly known as "Kothis". These mansion like homes belong to rich Sikh businessmen and residents who migrated from Pakistan after partition. Predominantly a residential colony, Kirti Nagar is an interesting fusion of residential, retail and industrial establishments making it a preferred choice to reside. Both the residents and the guests visiting Delhi enjoy an overall experience of shopping, eating and recreation in these malls. Kirti Nagar is also connected to Dhaula Kuan and the Central Business District near Connaught Place. The airport is just 17 kms away and the distance and can be reached within half hour. Considered one of the most talked about places in Delhi, Kirti Nagar is a great place to stay in and that is where a great packers and mover will help in making the shift smooth. PIKKOL Movers and Packers understands the customer's requirements thoroughly and offers high-quality services to satisfy customer’s demands. Employing world-class resources in the process of packing, loading, transporting and unloading, we pay full attention to every step involved in the moving process. Our well-trained professionals with an experience in local and inter-city moves can ensure that home shifting, office shifting or vehicle shifting is carried out with ease in Kirti Nagar. We at PIKKOL assure the safe and secure transfer of your goods as we value customer sentiments related to their belongings. 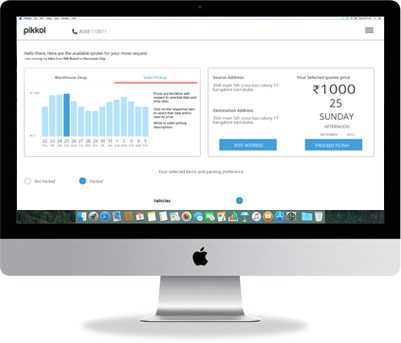 PIKKOL provides tracking assistance of your home or commercial materials and facilitates tracking of real time shipping details such as date of pick up, dispatch details and movement of your goods. Our professional moving and packing services guarantees you flawless shifting, moving and relocation services and timely delivery of your goods making your move to your destination a stress-free and a pleasant experience.